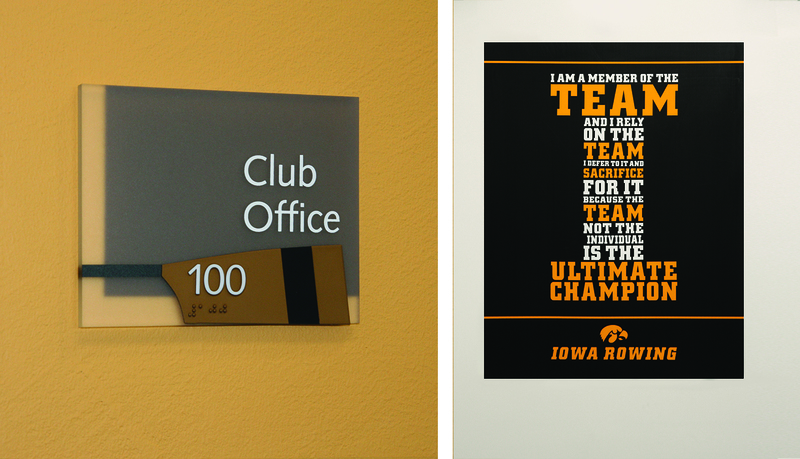 The P. Sue Beckwith, M.D., Boathouse is the University of Iowa’s first LEED® certified campus facility. 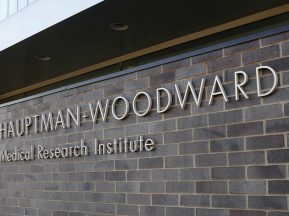 The boathouse, which is named in honor of Dr. Beckwith, a former UI student-athlete and noted Des Moines surgeon, is designed to house the University of Iowa’s Rowing Team and Rowing Club. 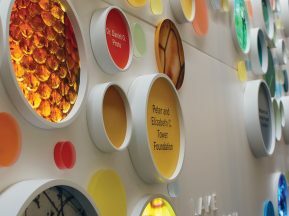 Located next to the Iowa River in City Park, the boathouse is designed to function next to the river and utilize the natural power of the sun and the wind to create an energy efficient facility. 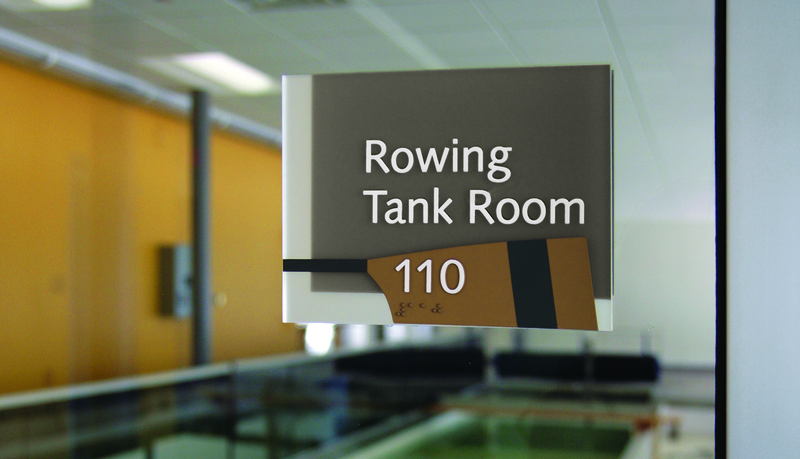 To complete the construction of the boathouse, a complete interior, exterior and donor recognition signage solution needed to be created and installed before the opening of the facility. 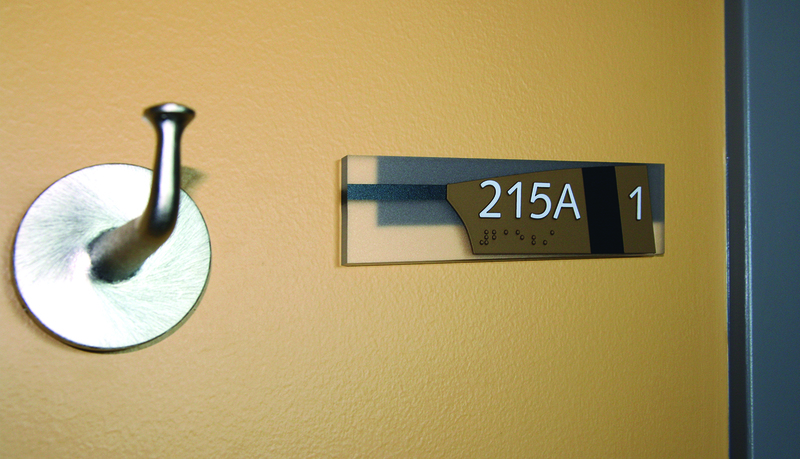 Because of the complexity of creating and delivering the solutions called for by the architect, the designer and general contractor, ASI was awarded the entire project. 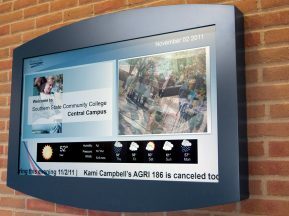 ASI, in partnership with Dan Van Woert, environmental graphic designer, created a complete interior signage and donor recognition solution for the boathouse. 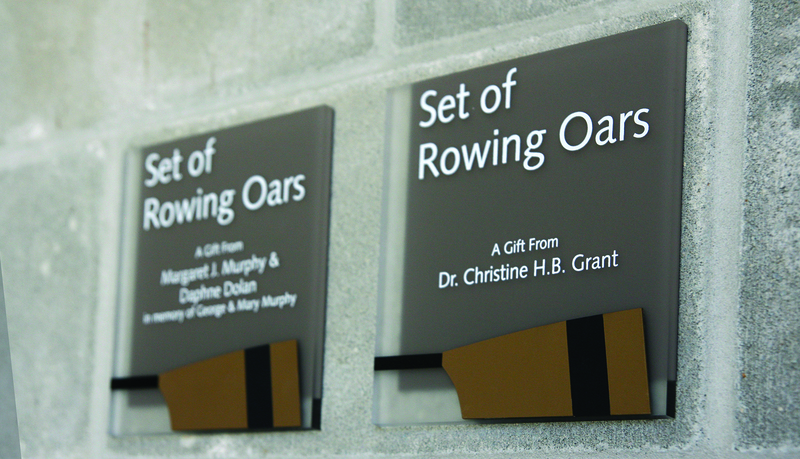 The inspiration for the signage design came from both the architectural features of the boathouse and the details of a rowing oar. 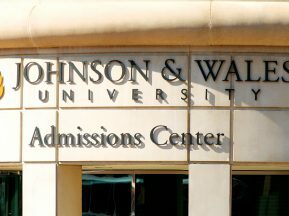 The complete donor recognition solution consists of a capital campaign donor wall, an expandable “Letterwinners” donor wall, room identification plaques, and exterior dimensional letters honoring the facility’s namesake. 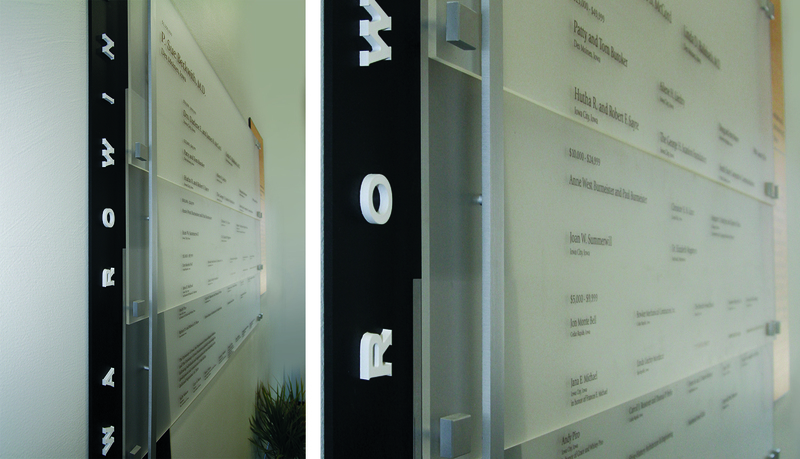 In addition to the recognition walls, a commemorative cast bronze plaque was fabricated to honor the lead donor. 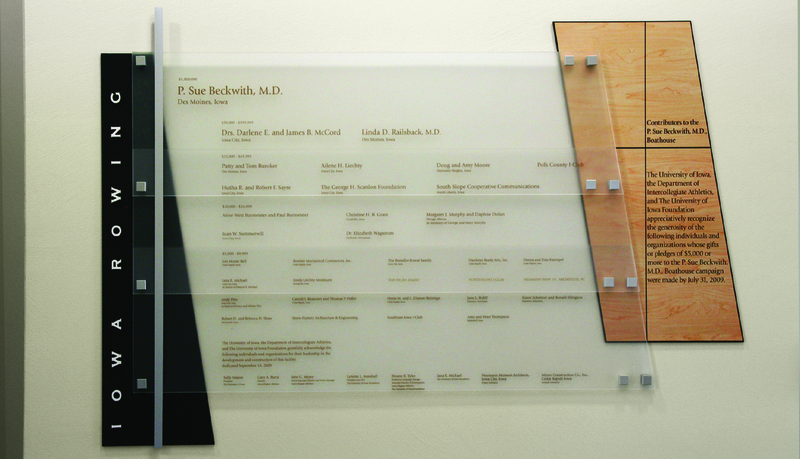 The plaque incorporates a detailed, “3D” portrait of the lead donor as well as information about the donor. 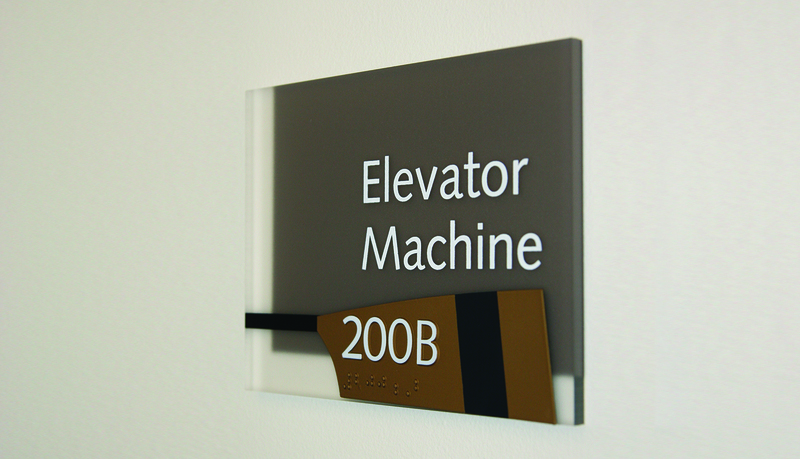 The highly customized interior signage solution incorporates a rowing-oar inspired InTouch™ ADA-Ready™ shaped plaque with Acrylite Crystal Ice acrylic and earthtone coloring to complement the design of the facility. 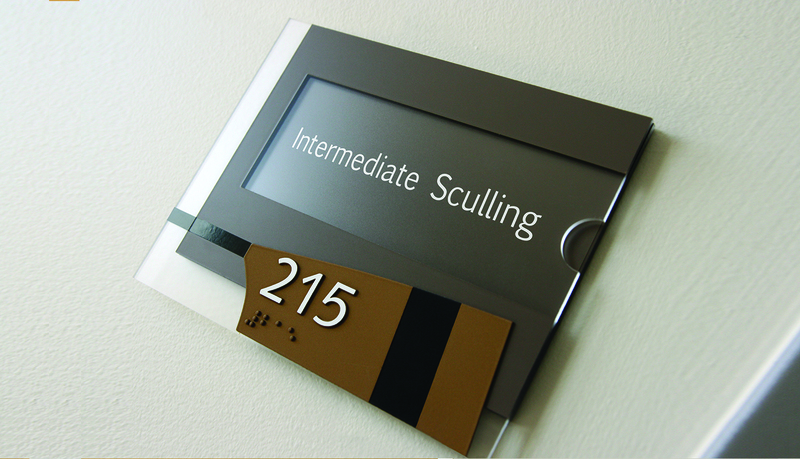 The interior signs serve the regulatory and identification requirements for of facilities in a beautiful and tasteful manner, and in key instances, they also highlight key boathouse donors.